The Crosby capsule, first applied in 1957, was used to obtain biopsies from the small intestine before the introduction of the endoscope. This self-opening capsule is a metallic capsule of 19 to 11 mm with a round opening of 4 mm (53). A long tiny tube is attached to the capsule, and this is muscle loaded through an endoscope which is passed into the second part of the duodenum. Intestinal mucosa is sucked into the tube by suction and excised. 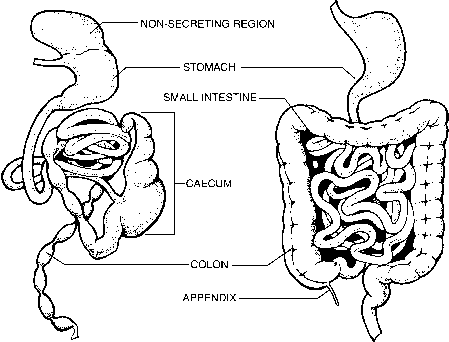 Every part of the stomach and the small intestine can be reached (63). Sizes of the biopsies are 5-8 mm, with stomach biopsies usually being smaller. Failure of obtaining biopsies is 6%. The mucous membrane is very mobile with respect to the muscular layer so only mucosa is sucked into the capsule, and the risk of perforation is very small. Muscularis propria is never cut. The risk of bleeding (0.14%) and intestinal perforation is very small (64). Capsules that can be opened electronically are also available. They have the disadvantage of a long interval between sample collection and culturing. During this interval, bacteria inside the capsule can replicate, and influence growth of other bacteria in the capsule. It is a very imprecise method. The advantage of this technique is that, like the Crosby capsule, every part of the small intestine can be examined. The disadvantage of the suction biopsy capsule used to provide specimens from the proximal jejunum is the need for radiological screening for the location of the capsule. This makes it unsuitable for repeated use in young children, and women who are or might be pregnant. There may be some discomfort when the procedure is prolonged. The technique fails in up to 10% of the cases. To overcome the problem of determining the sampling location with the capsule biopsy, it is better to take specimens with endoscopic forceps. Capsule biopsies are not common in current clinical gastroenterology practice (52).